Today I have for you guys a fun new little series, my ornament collection. Since our Christmas Tree is officially up and filled with ornaments, I decided that every Monday up until Christmas Eve I will be sharing a brand new post featuring a hand full of some of my favorite ornaments. Forewarning these posts will consist of a lot of Disney a.k.a. 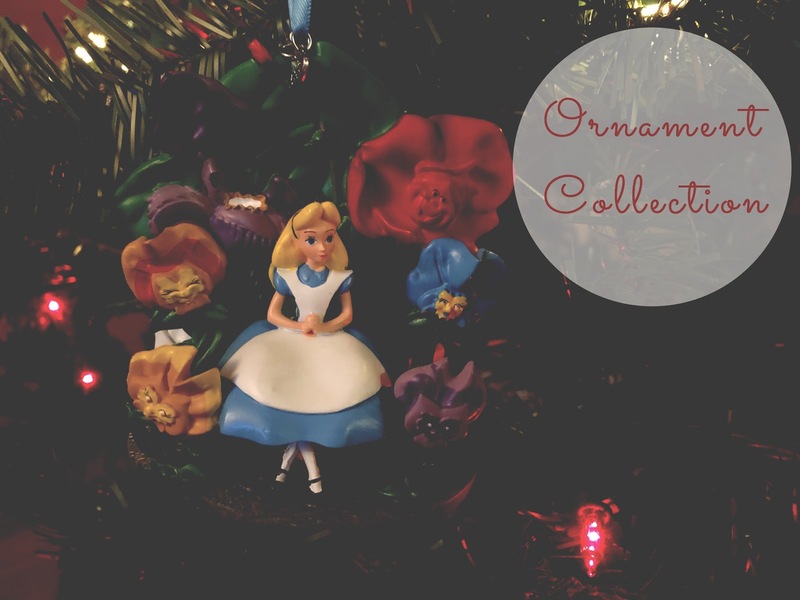 Alice in Wonderland ornaments. Ya'll already know the obsession! I try to pick up at least one new ornament a year and as I mentioned before during trips to Disneyland I would also try and purchase an ornament, or two, which turned into a tradition of mine. I want to begin a new tradition with you guys where I share new additions to my ornament collection throughout the years. Without further ado, here is the first installment to my ornament collection series. I will begin with a new addition to my collection a cute red felt retro Reindeer ornament from Target. As soon as I spotted this vintage looking Reindeer I fell in love with it. I simply adore Reindeers and this doe-eyed looking one was so different. It comes in two other colors which I'm kind of debating if I should go back and pick them up since the red was my favorite. Whimsical ornaments like this are some of my favorite and I love having them either on my tree my tree or displayed somewhere. Another recent ornament purchase is from the Dinsey Store. Every year they release new and occasionally bring back some previously released ornaments that are part of their Sketchbook Ornament Collections. All their ornaments also come with a little plate with the year it was released in. One of their new ones from this year is this Alice in Wonderland ornament of Alice with and the talk flowers. I absolutely adore when Disney releases Alice in Wonderland merch that contains more characters from the film. This ornament is so beautiful as you see Alice sitting down with the more well-known flowers and as you turn the ornament around you will find the lovely white rose on her own. I just love with ornaments have little-hidden surprises such as this one. Last year was mine and Rudy's first Christmas as Mr. and Mrs. I feel like it's only natural to slightly become obsessed with your new last name and I really wanted to add a monogrammed ornament of the letter Z to our collection. I purchased this budding monogram ornament from Anthropologie last year. I absolutely love it especially since it has an earthy vibe to. The gold pops and the leaves and flower accents are absolutely so precious. I adored it so much that I even gifted a few of these to some of my friends for Christmas last year. If you didn't already know, I really like matryoshka dolls. I even have one tattooed on my arm. I own a few different matryoshka ornaments but this glass one is probably my favorite of them all. I picked it up two years ago at Target, never did I think I'd find something so pretty like this there. This Russian doll is so pretty and I love the colors of the ornament with the gold glitter, along with the flowers around her. Lastly, I have yet another ornament from Target. Rudy and I picked up this felt Darth Vader a few years ago and we just had to add him to our collection. Rudy and I are Star Wars fans, Rudy is a lot more than me, and I felt it was only fair for him to start adding some of his favorites to our tree. Thank you so much for joining me in my first ornament collection post. I hope you enjoyed it. I would love to hear about some of your favorite ornaments. Until next time! Oh so many cute ornaments! Yay! Thank you so much girl, this really makes me happy to hear. It's such a fun tradition to have, especially when you look back at each ornament. They all tell a different story. Love this post!I really love the Z ornament that's probably my favorite. Every year Ricky & I also purchase a new ornament for our tree. This year we got two, one from Disneyland and one from Hallmark. I'm hoping to post about it on my blog. Thanks Imelda I really love that one as well. I'll look forward to reading that post of yours. I always admired your ornament collection posts from the past. Awe thank you Ana. I'm glad you enjoyed part one of my collection. Beautiful collection! I love the Russian doll.